I lay in bed last night, heart palpitating, head throbbing, that slightly edgy feeling where you feel you may go at any minute. And I thought “this all feels like too much”. What – you may ask? Had Sally’s health slipped backwards? Was her mum in hospital again? Had she been watching Newsnight and observed another distressing story? Or for those that know me, was that new electric toothbrush still playing up? The truth of it is, it was my To Do List – or to be more accurate, my Todoist. Yes I’m one of the many who succumbed to a multi-platform-device-functional, bells-ringing, with a cherry-on-top app that now is as close to me as my closest friend. For those familiar with my Toothbrush Traumas, you will not be surprised to hear the process of choosing the right app took two weeks (I admit part-time) of online research, and much comparing of the wonders of To Do List apps ‘for people with too much to do.’ Of course I have too much to do – I have just spent two weeks researching this. So arrives Todoist – the premium version of course, which means I can permanently pester colleagues (yes the upgrade accesses a ‘team app’ with full assignment capabilities!) and highly frustrate friends (who I lightly suggest join, then send multiple tasks to complete with specific deadlines). Still I love it. At first it’s in full use, filters and all, video and audio attachments, multi-coloured projects. That sense of achievement as I tick off that task and it disappears into the ether (or actually the ‘hidden’ completed folder) is parallel to none. If I’m honest I spend more time creating the To Do List, than doing the tasks on it. And then comes reality. Task after task after task. The ‘completion’ satisfaction wanes. The list grows. One ticked off, five added. It’s never-ending. Quite literally. And I start to feel at first heavy, then burdened and finally panicked, as the items multiply. That was a year ago. And I can now proudly announce that in the world of Todoist I am officially a ‘Grand Master’ (completing more than 20,000 tasks). The only way up is to reach the top position of ‘Enlightened’, for those special souls who have competed over 50,000 tasks. (Does adding an item and clicking ‘completed’ just to make myself better really count?). Back to last night. I lay in bed and thought am I really on the road to enlightenment? 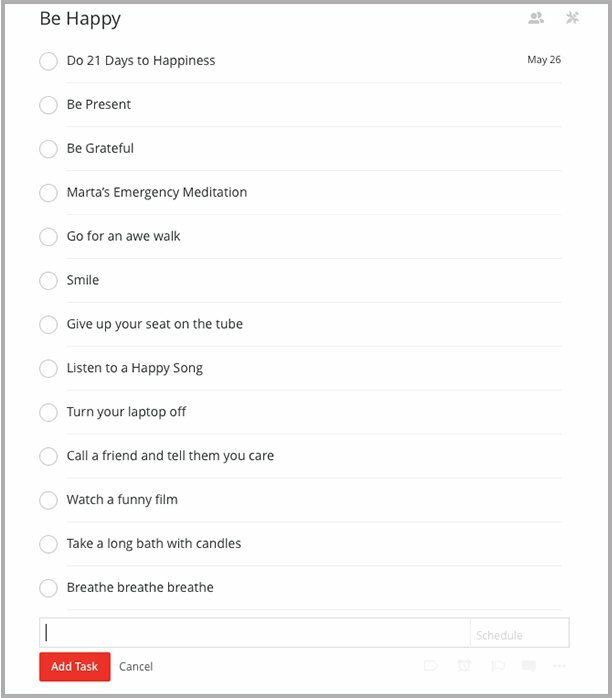 Marta’s magical yoga may help on that front, but I am not sure this to do list really is. 47 items to complete tomorrow before I leave for NYC is really stressing me out. I have been going to bed todoist-obsessed, frantically allocating time for tasks, and always knowing there’s never enough. Todoist is in my waking thoughts, as a morning ‘list-analysis’ kick-starts my day. And then on came the news. Genuine tragedy, real heartache, worldly worries. And I thought what am I doing? Creating my own unhappiness by this obsessional attitude towards TO DO TASKS. Is it a way of trying to control the controllable, just because I can? Or do I simply just have too much to do? At this point I would normally quote a piece of fascinating research about how my brain has changed over the past year since I’ve been using the software, added to an interesting theory about modern technology usage etc., etc. But instead I’m going to revert to the simple yet effective 21-Day Toolkit! I’ve been limiting my own happiness. I’ve been obsessing over the future and not living in the present moment. I’ve exhibited minimal self-compassion with these ever growing lists and expectations. Digital detox – I don’t think so. And there’s not been a single ‘dance to your happy song’ item on the list. So to do list or not to do list – that is the question. I guess it’s not the ‘list’ or ‘app’ that manages my ‘to do’s’ that’s the problem. It’s how I manage the management. Hmmm. HH Blog ‘complete’. Tick. Good momentary feeling. Down to 19 remaining tasks. Yippee. I know you Sally, however, I don’t know how you fit it all in. It’s early morning here, and I have just read your todoist. Very inspiring, and now a bit worrying for me. Reminds me, I have to get on with it. You have a great time in NYC . And hope you managed to get all your packing done in good time.!! !